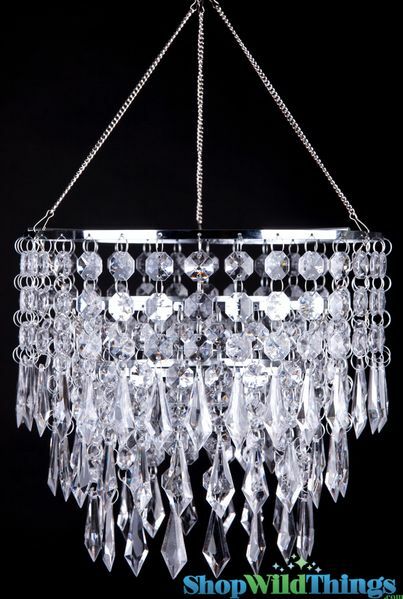 Home > Lighting > Chandeliers > Chandelier "April" 3 Tier Crystal 10.5" X 10"
Three sparkling tiers of pure deliciousness! Chandelier with 8" chain and 3 layers of clear multi-faceted acrylic octagons and a lovely 2" pendant at the end of each strand. Top ring is 10.5" diameter, inner ring is 8" diameter and bottom ring is 6" diameter. The chandelier is 10" from ring to bottom bead and overall hanging height is 15" including the chain. This is a chandelier decoration and does not come with a Light Cord Kit but it is designed to hold one or just use it by itself as a pretty decoration to fill up the air space with glittering beauty! You might also consider placing our LED Saucers on top. We have a standard white color LED Saucers (which look great! ), or you can use our Colorful LED Light Saucers on top too to really change the color of the chandelier to match your event. Recently bought new all white bedroom furniture. Going for a minimalist look. Had an empty corner, above my side table. This chandelier was perfect! Not huge. Girlie and classy. Great buy. ProsGreat size. Looks so cute. Price was was perfect. Love this chandelier it has enhanced the space . This chandelier is very pretty and elegant looking. I am going to use it for a bridal shower backdrop. Great chandelier that adds a bit of fun sophistication to my bathroom. The chandelier is very pretty but the dimension of the mounting opening for the light kit was too large causing the light kit to simply fall thru. I had no time to wait for an exchange or help so I made my own adjustment with a purchased part from the hardware store. ProsVery pretty especially with the multicolor changing led light bulb. I would recommend this providing the recipient could make the necessary adjustments. This was just the perfect touch for my daughters room! Perfect for table top elegance! It dresses up my outdoor gazebo with just right amount of bling! I was pleasantly surprised of how beautiful this chandelier looks. Beautiful for the price! 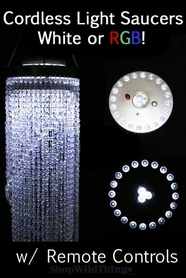 Hung it under a recessed light in my bathroom for a mini chandelier look. Amazing price for such a beauty! I received my chandelier today and had it hanging in minutes. I bought the remote control LED lights for the top and it is absolutely stunning!!! No one would know the small price for such a beautiful piece. Perfect size for our 38 x 70 dining table. ProsSize is perfect for area I bought it for. Crystals shine brightly under LED lighting. Lots of crystals so there aren't open spots. I like the April Chandler . It is one of the few chandlers that I have found that is on the smaller side. It seems well put together, it's nice and light for hanging and seems like it will be easy to clean. Quite a fun little item. ProsAll rings hang well, nice and even. It is light so can be used in quite a few different locations. ConsNot really a con but I wish they came in different colors of metal. Beautiful old hollywood style, perfect! Great price. This is exactly what I needed for my sister's Marilyn Monroe inspired old Hollywood themed bathroom. It is the missing piece to make this bathroom perfect. Great price, fast shipping, looks expensive but price says otherwise. Have shopped here in the past, and very happy with my purchase. ProsGreat price, elegant and vintage but such a great price!!! Got today, was pleasantly surprised. ProsIt's cute. Perfect for my daughter's bedroom.